The WBIG has responded to a tip of a significant radio ad spend involving Democratic contenders in the upcoming Luzerne County Controller’s Primary Election, as both candidates took their messages to the airwaves on May 14th. Stephen A. Urban told the Gazette that he faxed a 24-hour notice advising the county Bureau of Elections that his campaign is spending over $500 on a single block of radio advertising in accordance with Mr. Urban’s interpretation of campaign finance reporting requirements. His opponent, Michelle Bednar, also took to the airwaves with a similar buy-in according to her finance treasurer, Gary Zingaretti. While the Bednar campaign did file 24-hour contribution notices for donations over $500, it has not filed any such 24-hour notice of the May 14th radio buy, which also exceeded the $500 threshold. Zingaretti explained the action by claiming the filing isn’t required under the campaign finance law because of the use of the term “independent expenditure” in that law. “. . . any candidate or political committee, authorized by a candidate and created solely for the purpose of influencing an election on behalf of that candidate, which receives any contribution or pledge of five hundred dollars ($500) or more, or any person making an independent expenditure of five hundred dollars ($500) or more after the final pre-election/pre-primary report has been deemed completed shall report such contribution or expenditure to the appropriate supervisor. The candidate, chairperson or treasurer of the political committee shall send the report of late contributions within twenty-four (24) hours of receipt of the contribution. The same shall apply to persons making independent expenditures. 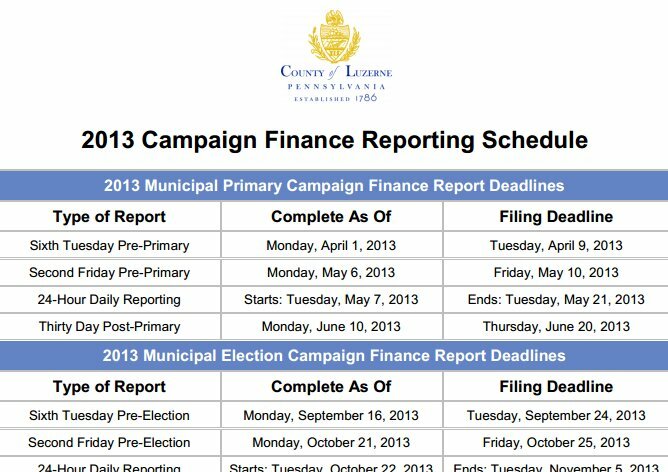 Michael I. Butera, solicitor for the Luzerne County Bureau of Elections, clarified to the Gazette that candidates are required to report any contributions over $500 within 24 hours, but expenditures over $500 made by the candidate directly are not subject to the 24 hour reporting clause. According to campaign finance reports, Bednar is poised to easily outspend Urban, who’s campaign balance began with close to $2,300, with only $859.34 left available for disbursement as of the date of last filing. Bednar’s campaign reported a beginning balance of $9,412, and as of the May 15th reporting date $4,866.31 remained. According to public campaign finance filings, about 2/3 of Bednar’s contributions have come from PACs (political action committees), the largest donation being in the amount of $5,000, made by the IBEW PAC Voluntary Fund in Washington, DC. A spokesperson for the IBEW (International Brotherhood of Electrical Workers) in Washington, who would only provide her first name, Janette, said the $5,000 donation was not the only donation her organization has given to the Bednar campaign, and that in fact, there were several others, ranging in amounts from $250 to $500. The smaller donations the IBEW representative referenced do not appear in Bednar’s campaign finance reports. Zingaretti also refused to comment further on just who at IBEW Local 163 made the request for IBEW Washington to make the contributions, stating that he was only aware of the $5,000 contribution, and that if any other contributions were made, that would have happened prior to his coming on board with the campaign in March of this year. Ron Ruman, press secretary for the Pennsylvania Department of State, told the Gazette that the IBEW PAC Voluntary Fund is not registered with the Pennsylvania Department of State Campaign Finance Division. Neither does the Luzerne County Bureau of Elections possess filings for the IBEW PAC Voluntary Fund, the Gazette has learned. Asbestos Workers PAC, another Washington political action committee, which also donated $500 to the Bednar campaign, does not have updated filings, according to the Luzerne County Bureau of Elections. Calls to Ms. Bednar seeking comment were not returned.